We crossed the continent, dipping in and out of each track we passed for some furtive racing before skittering off to the next venue. After our tour of Europe we took an 11 hour slumber jet to Korea for our final race, and first view of the Olympic venue for next year. 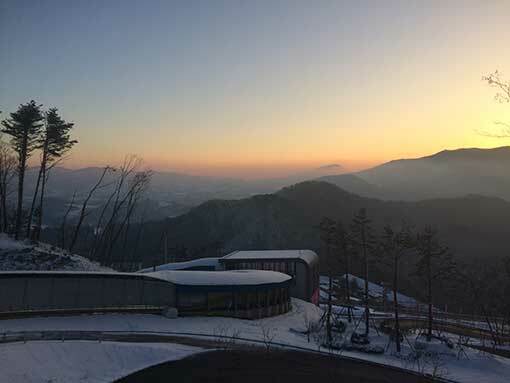 The area around PyeongChang is beautiful, and after our first morning at the track Instagram was flooded with views of the rolling hills and ski slopes surrounding us. The track is a good one, and presents some challenges which quickly dispelled the rumours that it’d be easy to get down and a push monster’s haven. Although we were staying in a resort and so were insulated from the real Korea, we did manage to find some unpronounceable places with local delights and the opportunity to embarrass ourselves with woefully poor attempts at the Korean language – which were well taken by the locals that were subjected to them. The first week consisted mainly of battling jet lag, confusion and disorientation to learn our way down 16 corners of Korean ice. This was followed by a second week of figuring out where we could unlock speed from the track, and a third week building up to the race culminating in an anticlimactic slump over the finish line and rather rushed pack and leave. The race was won by Latvian superhuman Martins Dukurs, who pipped the hometown hero Yun Sungbin by the tightest of margins on the second run to take the gold medal and the World Cup title. Margins were tight throughout the field with just a few tenths of a second separating the rest of the athletes in the top 10. During my first run I provided a demonstration of what not to do in the tricky corner 9-12 non-straight, which cost me a lot of time that I couldn’t make up on my cleaner second run. Consolation came from some very encouraging runs during the three weeks we had there before the race, and despite the pitiful result I can probably say that the track in Pyeongchang is one of my stronger tracks. Hopefully one where I’ll be successful in the future!